The company specialises in providing clients with a customised service that offers good quality UK-sourced furniture without the hassle of arranging delivery and ordering furniture in the UK. Furniture for France works with its customers all the way from the initial enquiry through to installing the furniture in their homes. Offering advice on all aspects of a customer’s order, such as sofa coverings, wood finishes and delivery schedules, ensures they are kept informed every step of the way. “With 15 years’ experience and thousands of deliveries under our belts throughout France, we have encountered almost everything and put that to good use when advising and helping customers find the right furniture for their property in France,” said the company’s managing director Brian Muir. The delivery service offered includes room by room installation of all furniture ordered, this includes assembly of all oak beds and wardrobes as these come in sections for ease of access to difficult staircases. All other items are solid, no assembly pieces. Our deliveries are timed to the hour on the agreed date of delivery. The Furniture for France facebook page will keep you up to date with all the latest news. Six new ranges of oak have recently been introduced, including traditional styles in a rustic finish. With competitively priced solid oak furniture it is no wonder Furniture for France had its best ever year in 2017. In addition to the new oak furniture a choice of 12 different paint colours are now available on all pine furniture. Wood samples can also be sent out to customers if required. “With delivery costs starting at just £59 for any quantity of furniture, there really isn’t a better or easier way to furnish a property in France,” said Mr Muir. Throughout 2017 sofas continued to be the best-selling individual item for the company. 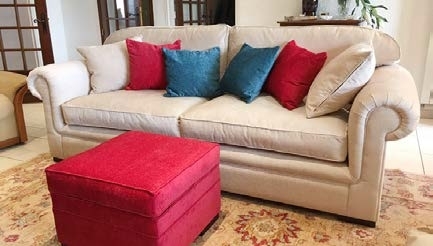 Loose-covered designs are always top of the list with the introduction of more complex fabric patterns and colours allowing customers to custom cover the sofa of their choice. “This process can take some time to work through, but as the product has a life expectancy of over 15 years, it pays to get it right,” said Mr Muir. Furniture for France makes deliveries as far afield as Geneva and Nice, as well as locally to customers in the Dordogne, the Lot, Charente and Limousin.